Waterproof and breathable leather boots from the leading outdoor brands. From Gore-Tex hunting boots from Meindl, to fashionable leather country boots from Dubarry and Dublin, we have always been famous for our collection of high quality leather footwear. For iconic country style look no further. The Dubarry Galway Boot is probably the most famous and desired of all leather country boots, and is as practical as it is good-looking. 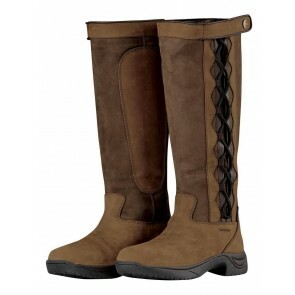 The best-selling Longford country boot from Dubarry with GORE-TEX lining. Fashionable leather country boots, waterproof to the ankle. Featuring a unique side lacing system and touch tape closure at the top of the leg for full adjustment, these boots easily accommodate a variety of calf widths - plus they are as good looking as they are practical. Stylish ladies leather boots. Comfortable and breathable, perfect for life in the country.